Christina Aguilera's rep said quotes about her weight were made up. Christina Aguilera certainly isn't afraid to own her curvaceous figure--fans need only look to her latest music video for confirmation of that empowering fact. But unfortunately, the same can't be said for her recent supposed interview with Billboard magazine. While it's true the 31-year-old "Your Body" singer does indeed grace the Sept. 29 cover of Billboard magazine to promote Lotus, her new album out next month, it turns out that the purported excerpted portion of the interview that made the online rounds this morning (in which Aguilera supposedly commented on her body and seemingly declared that she was tired of being a "skinny, white girl") were patently made up. 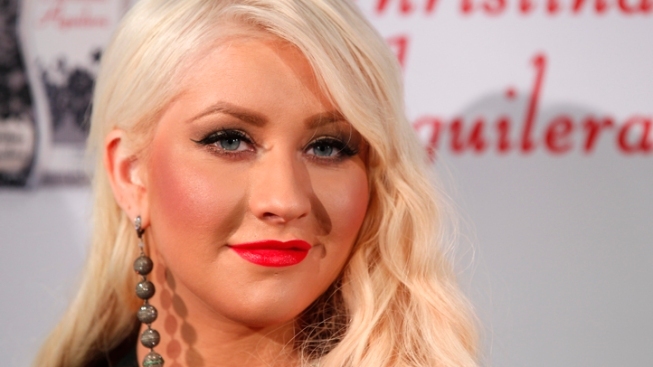 "The comments are fake," Aguilera's rep told E! News. Billboard was also quick to deny the quotes' veracity, saying they were never in or published by the magazine. Only a portion of Aguilera's full Billboard interview appeared on the website as a preview, and needless to say, the false weight comments were not included in that excerpt. Instead, it seems the comments first appeared on Us Weekly's site under the guise of a sneak preview excerpt. It's unclear where Us got hold of the comments in the first place, but the magazine has since removed the article that contained the faulty quotes. As for what those offending quotes were in the first place? "During the promotion of my album Stripped [in 2002], I got tired of being a skinny, white girl," read the supposed sound bite. "I am Ecuadorian but people felt so safe passing me off as a skinny, blue-eyed white girl." The Voice coach was also falsely quoted as speaking of her fluctuation: "The next time my label saw me, I was heavier, darker and full of piercings!" "Let me tell you, that wasn't an easy pill for them to swallow. I had gained about 15 pounds during promotion and during my Stripped tour [with Justin Timberlake]. They called this serious emergency meeting about how there was a lot of backlash about my weight. Basically, they told me I would affect a lot of people if I gained weight--the production, musical directors. Carson Daly says The Voice shake-up will "keep things fresh"
"[They claimed] people I toured with would also miss out if I gained weight because I would sell no records or tickets for my shows. I was young, so I lost the weight quickly and was toothpick thin during Back to Basics promos and touring." The false quotes continued and got more creative from there, but that's not to say that all of Aguilera's quotes were pulled from thin air. "This album represents a celebration of the new me," she (actually) told Billboard, "and to me the Lotus has always represented this unbreakable flower that withstands any harsh weather conditions in its surroundings, that withstands time and remains beautiful and strong throughout the years." Now that sounds more like our girl Xtina.